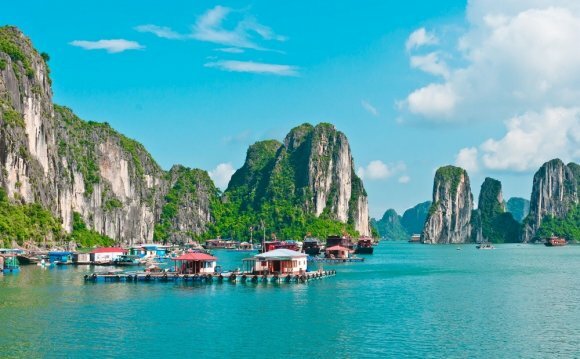 Located on the east coast of the Southeast Asia peninsula, bordering China, Laos and Cambodia, Vietnam is a beautiful nation steeped in culture and history and blessed with stunning tropical beaches. Bookended between two great cities, Hanoi and Ho Chi Minh City, in the north and south respectively, the slender nation of Vietnam is blessed with stunning beaches that meet the emerald South China Sea, ancient ruins, lush jungles and verdant paddy fields. On a holiday to Vietnam you'll find lively, fun-filled cities, peaceful beach resorts, ancient ruins and temples and exquisite cuisine with a distinct French tinge, where you're almost as likely to see someone enjoying a croissant as a bowl of pho. Hanoi is Vietnam's capital and one of the most vibrant and unforgettable cities in Asia. Among the premier draws of a holiday to Vietnam, Hanoi, although a bustling metropolis, has managed to retain its traditional charm and intrigue. A city of majestic colonial buildings, atmospheric winding alleys and streets, old artisan quarters, tranquil lakes, ancient temples and ornate pagodas. The city has a wealth of world-class museums, exquisite restaurants, lively bars and jaunty markets. Be sure to visit the house and mausoleum of Ho Chi Minh. Hanoi also serves as the ideal base from which to explore serene Halong Bay - arguably the most stunning natural attraction in the country. Da Nang|da is the fourth largest city in Vietnam and played a key historical role in the war, making it a popular place with history tourists. There are also numerous gorgeous beaches within easy reach. Hoi An, a Unesco World Heritage site, is one of the most popular destinations on a holiday to Vietnam. A laid-back coastal town with a great beach, it is home to many ancient ruins and temples. The city enjoys a reputation for excellent tailoring, and shopping for high quality bespoke clothing at bargain prices is an essential endeavour on holidays to Vietnam. Nearby is Hue, often described as Vietnam's most beautiful city, and home to a treasure trove of historic attractions from Vietnam's ancient imperial past. Once upon a time it was known as Saigon, a city inextricably linked to what the locals call "The American War". Today, Ho Chi Minh City is a youthful, fun and charismatic city that blends tradition and modernity effortlessly. Grand tree-lined boulevards and elegant colonial residences recall the days when this part of the world was under the rule of France, while Taoist pagodas evoke images of far older times. But remember this is the face of 21st century Vietnam and awash with sparkling new shopping malls, skyscrapers, coffee shops, sleek bars, karaoke joints and lively nightclubs - the city's nightlife is legendary. As with Hanoi, the city's museums are world-class, while additional highlights include the Jade Emperor Pagoda and the ugly yet incredibly symbolic Reunification Palace, which is a must for war history buffs. Stay in Ho Chi Minh City to enjoy trips to the Mekong Delta and Cu Chi tunnels. From the city you can also easily reach the tranquil, sunny beach resorts of Phan Thiet. and Mui Ne, which are the places to go to enjoy a little seaside relaxation on a holiday to Vietnam. Follow the coast north, and you'll come to Vietnam's premier beach holiday destination, Nha Trang. Home to a curving four mile-long stretch of golden sands lined with an excellent range of accommodation, and offering plenty of activities for all ages, Nha Trang is a popular choice for relaxing beach breaks in the tropics.